For a retailer, cutting prices generates a certain amount of self-inflicted pain through the P&L. The problem is rather intuitive; existing customers continue to purchase the same amount of goods at the new lower prices (hurts sales growth) and it takes time, to an uncertain extent, to attract new customers to the better value offering. Whole Foods faces a dilemma because its tremendous success over three decades has attracted new competition in the form of copy-cat stores and a change to more up-scaled/organic offerings at traditional grocers. On the company’s conference call, founder, John Mackey, pointed out clearly: “Whole Foods is no longer a bunch of hippies selling products to other hippies”. Anyone visiting the stores knows he is exactly right – Whole Foods is now main-stream for the health conscious portion of the American public, which increasingly seems like everyone. The presentation of a new multi-year strategic approach to address competition, and proactively slash prices, creates an investment opportunity, for the patient, who believe in the concept, and the superior customer experience at the stores. Yesterday’s earnings conference call was an entertaining one; a number of hit-by-a-freight-train sell-side analysts, with Buy Ratings, and price targets in the vicinity of $65-$70, lambasted the management team, well, for making them all look rather silly, and confidently focusing on the longer-term in the face of a substantial miss to Street expectations. CJF particularly enjoys when sell-side analysts question visionary founders, who have created a $17bn company, on strategy! Current quarter results came in at $0.38 (a $0.03 miss) and full year guidance (year-ending September) is cut to $1.52-$1.56 (Street was at $1.61). A new reasonable estimate for September 2015 full-year earnings is $1.75. Despite guiding to 4%/7% below FY14/FY15 Street estimates, the shares are down a cool 14% in the after-market. And, this is after considerable weakness in advance of results (shares peaked at $65 and closed at $48 yesterday). Clearly put, WFM stock was overvalued. At its peak price, the shares traded at 34x out-year earnings estimates. Even a 30x multiple, twice the valuation of the market, seems stretched, and at the high-end of what can be considered plausibly sustainable. In the near-term, WFM earnings growth will slow (the current quarter saw just 1% operating profit growth) because gross margin is in the process of cresting from 35.5% back to a sustainable range of 34-35%. 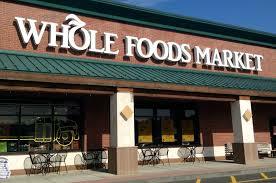 WFM is proactively lowering prices, and reducing gross margin to position for the longer-term. Sentiment just swung from positive to sharply negative (listen to the call) and there will likely be numerous downgrades tomorrow. Valuation matters – using after-hours quotes of $41 the multiple is down to 22x FY15 EPS from 34x at the peak. CJF believes in the Whole Foods concept – the stores are better, food quality can be trusted (at least on a relative basis) and the shopping experience is superior. At reduced price gaps to traditional grocers Whole Foods will continue to convert customers over time. WFM is still a preeminent US growth stock – the opportunity to more than triple the store base from 379 stores to 1,200 still exists (the opportunity for more stores actually grows as you cut prices). In several years, the Whole Foods store base will be dramatically higher, leading to substantial growth in sales, profits, and cash flows. Purchasing the stock at close to 20x earnings (a reasonable valuation relative to the market for all the growth) will reward investors with patience and fortitude to own the shares during a controversial period, out-of-favor with the Street, albeit, at a much cheaper valuation.